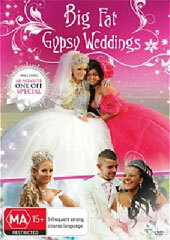 Big Fat Gypsy Weddings DVD Review This is hardly gritty cinéma verité, however, so I think such points of criticism are unwarranted and irrelevant for the material presented. This largely sympathetic look into the usually closed communities of 'Romany gypsies' or 'travellers' in Britain and Ireland is interesting, bubbly and definitely colourful. Each of the five episodes, 'Born to be Wed', 'No Place Like Home', 'Desperate Housewives', 'Boys Will Be Boys' and 'Bride & Prejudice' have at their core at least one (but usually more) wedding ceremonies, with the perspective and emphasis changing depending on the title. The traditional, church-linked life stages are very important to the communities' members and hence feature prominently. They start from first communion, at age eight, and the wedding is a highlight, usually during a girl's late teens. The dress takes on a whole new level of importance, as preference for shine and colour dominate all. Taste among those being filmed is very much subjective, but they seem comfortable in that knowledge. There is a lot of attention in the documentary devoted to the superficial splendour of the ceremonies and preparations for them, but other areas of interest to the viewer (like me), such as lack of school attendance or interaction with non-traveller residents or doctors or police are simply mentioned or skimmed. This is rather disappointing but to be expected of a title like Big Fat Gypsy Weddings. It is basically the cream on top of a multi-tiered cake rather than the hidden sponge that this show looks at. There is a risk in the temptation to view these people are cartoonish stereotypes preoccupied with gauche fashion and kitsch housing. The invitation to laugh at rather than laugh with is never explicitly revoked by the filmmakers, which made me uneasy. There is discussion at the IMDb message boards about the kind of English spoken in the show (subtitles are sometimes used) and how authentic and representative the people in this documentary are. This is hardly gritty cinéma verité, however, so I think such points of criticism are unwarranted and irrelevant for the material presented. I liked the taste of traditional music on the soundtrack but would have relished much more. The narrator, Barbara Flynn, can get a bit draining. There is also a lot of (explicable) focus on dressmaker Thelma Madine. The impression I got is that the series is half about her and the dresses she confects. Packaged as a '60 Minute Special', there is a stand-alone episode simply called 'My Big Fat Gypsy Wedding' which is a neat summary of the whole series and very watchable. There is no other bonus material but there are subtitles. This show will appeal to the wedding-tragic crowd and lovers of fluff and colour.